After Cloud Atlas helped show audiences that Andy and Lana Wachowski, the siblings who brought us The Matrix trilogy, hadn’t lost their touch, all heads have now turned in excitement towards their next effort, Jupiter Ascending. Though prinicipal photography has already been going on for a few weeks, filming began today in London and thanks to a press release, we now have an official synopsis that provides some more insight into what the Wachowskis have in store for us. From the streets of Chicago to far flung galaxies whirling through space, Jupiter Ascending was conceived and written by the Wachowskis, who are also directing. Award-winning producer Grant Hill, with whom the writer/directors have collaborated since “The Matrix” Trilogy, is producing the film together with the Wachowskis. Roberto Malerba and Bruce Berman are serving as executive producers. So, what do you think? It sounds pretty exciting and definitely like something that is right up Andy and Lana’s alley. I loved Cloud Atlas and have high hopes for the next project from the Wachowskis. They’re promising pretty big things for the film and seeing as they have delivered on blowing our minds in the past, I see no reason to doubt them this time. Rest assured, this film will be something truly special. Aside from Tatum and Kunis, Jupiter Ascending will also star Sean Bean, Eddie Redmayne, Doona Bae, Douglas Booth and James D’Arcy. It hits theatres in 2D, 3D and IMAX on July 25th, 2014. Are you excited for the film? 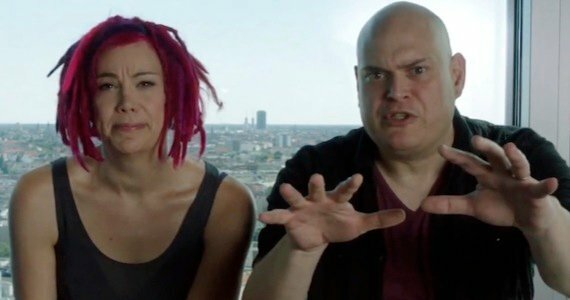 What do you think the Wachowskis have in store for us? Let us know in the comments.